Failing tech isn’t new. Cars being refused an opportunity to compete is not new. With that said, the repercussions for missing qualifying need to be so severe that you’d want to avoid them at all cost. Currently those types of repercussions aren’t in place. Of the thirty-seven drivers in the starting lineup, thirteen failed to make qualifying runs Friday because their cars didn’t pass inspection. They will start at the rear of the field Sunday based on positions in the point standings. Kevin Harvick’s victory Sunday at ISM Raceway in Phoenix set him up with a historical opportunity. It was the third consecutive Monster Energy NASCAR Cup Series win in the young 2018 season for Harvick. Should he win this Sunday at Auto Club Speedway (3:30 p.m. ET on FOX, MRN and SiriusXM NASCAR Radio) in his native California, he would become the first driver since Jimmie Johnson (2007) to win four consecutive Monster Energy Series races. Interestingly, in the K&N Pro Series West race last Thursday, series regular Derek Kraus pushed Harvick up the track in Turn 4 and knocked the hottest driver in the Monster Energy NASCAR Cup Series out of contention. Harvick was only able to get back to fourth at the finish. Three of the five Monster Energy NASCAR Cup Series drivers from California have wins at Auto Club Speedway – led by Jimmie Johnson’s track-best six victories. The El Cajon, California, native – who captured the first of his 83 Monster Energy Series trophies at the track – has finished in the top-10 in a remarkable 16 of his 23 starts and won a pair of Busch Pole awards too. His five runner-up showings at Auto Club are also a series record. Kevin Harvick and Kyle Larson also have track wins. Kyle Busch’s runner-up finish to Kevin Harvick last week at ISM Raceway marked his third runner-up showing in the last five races – dating back to the 2017 Homestead-Miami Speedway season finale. 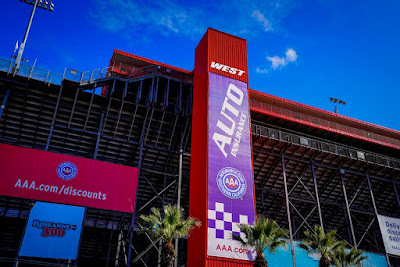 Three of the sport’s highest profile drivers – including reigning Monster Energy NASCAR Cup champion Martin Truex Jr. – are still looking for their first-ever win at Auto Club Speedway. Truex, Denny Hamlin and Joey Logano are a combined 0-for-44 at the track. And all three are hoping to score their first win of the 2018 season in Fontana this week. Last week’s third-place finish for Chase Elliott was a season high for the Hendrick Motorsports driver and perhaps a solid launching point as he heads to one of his historically best venues, Auto Club Speedway. Unfortunately, the No. 9 Hendrick Motorsports team received an L1-level penalty for a rear suspension violation following last weekend’s race at ISM Raceway in Phoenix. William Byron led the first Monster Energy NASCAR Cup Series laps of his career Sunday at ISM Raceway, pacing the field for 15 laps and recording a season-best 12th-place finish. He moved up to 21st position in the standings coming to Auto Club Speedway, where he has only one NASCAR national series start, which resulted in a fifth-place finish in the NASCAR Xfinity Series last year. However, Byron's car is one of the thirteen to fail tech - so the rookie will have to start in the back of the field. Stage Points Update: Three-time race winner Kevin Harvick leads all drivers with 53 stage points. Kurt Busch (42) and Martin Truex Jr. (41) round out the top-three.